Healthaid HEALTHAID AGNUS CASTUS 550MG Product #: 5.0 stars based on 1 reviews 5.0 1.0 SOM Price: Rs.1093.50 Rs.1093.50	Available from: SAVEONMEDICALS.COM In stock! Order now! 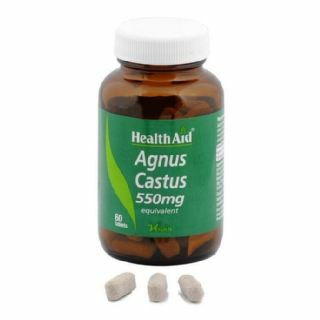 HealthAid Agnus Castus tablets have been created with the extract of the Agnus castus herb that has been in use since ancient times to help in controlling and regulating the functioning of the female reproductive system. In a concentrated tablet form, Agnus castus extract can provide you with better health. These tablets are helpful in regulating hormonal functions and relieving problems faced at the time of menstruation. Consuming these tablets on a regular basis aids in stimulating the release of the luteinising hormone, which helps in regularising the onset of menstruation. It also helps in controlling another hormone prolactin from being produced excessively and leading to infertility among women. Also, these tablets reduce the occurrence of premenstrual syndrome symptoms, like anxiety, mood swings, stress and insomnia. These HealthAid Agnus Castus tablets are also beneficial for breast-feeding women, as they help in enhancing the milk production for the infants. So get a pack of HealthAid Agnus Castus tablets to improve your health. What is the frequency of use of HEALTHAID AGNUS CASTUS 550MG? Have you been prescribed HEALTHAID AGNUS CASTUS 550MG by a doctor? How do you rate HEALTHAID AGNUS CASTUS 550MG on price? This page was last updated on 30-01-2018. Q1) Is HEALTHAID AGNUS CASTUS 550MG effective? Q2) What is the frequency of use of HEALTHAID AGNUS CASTUS 550MG? Q3) Have you been prescribed HEALTHAID AGNUS CASTUS 550MG by a doctor? Q4) How do you rate HEALTHAID AGNUS CASTUS 550MG on price? Q5) What is your overall rating of HEALTHAID AGNUS CASTUS 550MG? Is HEALTHAID AGNUS CASTUS 550MG effective?